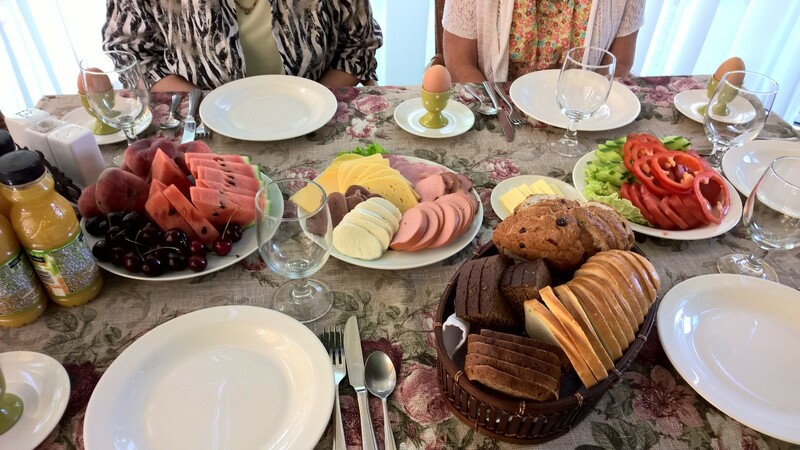 Today we enjoyed the breakfast part of our bed-n-breakfast. It was SO GOOD! Bread and meats and cheeses and vegetables and fruit and one little egg each. The array was amazing and all was fresh and good. We thoroughly enjoyed this start to our day. After breakfast we spent the morning walking around Cesis and seeing the sights. Cesis is home to the ruins of a midieval castle. We toured the castle with our candle lanterns, including some of us climbing down into the dungeon on a very steep steel-runged ladder. We also climbed into the tower to take in the 360 degree view of Cesis. One of the best aspects of touring the castle today is that it sits on a rise above the amphitheater where the Song Festival combined choir sang tonight. This morning and afternoon they practiced diligently on the amphitheater stage. Because of that we were treated to an incredibly beautiful sound track to our trek through the castle. At one point we heard “Be Thou My Vision” as we walked in the ruins. The castle was built about 100 years before that song came into the repertoire of Christian music. We stopped around lunch time and enjoyed c offee and a small bakery treat and then shared a mid-afternoon lunch with the singers and instrumentalists who had practiced hard all day. The concert was such a gift and blessing. We started the evening off with rain — quite a bit of it! The wait time and the first few songs were pretty damp, but then the rain let up and all of us were thankful. There must have been near 300 voices in the choir and an orchestra of 40 or 50. The music was varied with several pieces we all recognized and others that were completely new to us. The choir showed amazing stamina and gifting. They stood in the rain waiting for their entrance and then stood on the steps behind the stage in the wide open and for part of the time in the pouring rain! But nothing phased them — their singing was beautiful and expressive. At the end of the concert we had opportunity to say hello and good-bye to friends we’ve made over the last week. We were particularly touched by our friends Maris and Ilze who brought us each a framed picture taken when we were with them last week. We invited them to Corvallis and they seemed to think it might happen some day! That would be so sweet! Tomorrow we will enjoy Sunday worship with this big, beautiful group of people we have grown to love. We will pray for you and miss you as we cherish the last bit of time with our new friends from Latvia. Tomorrow we will also say good-bye to Kim as she returns to Riga and then on to Austria on Monday morning. The rest of us will move to Martina and Sandijs’ home to spend a couple of nights with them. It is astounding to realize just how soon we will be stepping on a plane to head back to Corvallis. How we will miss Laima, our friends from Matthews, Martina and her family, and the Latvian people and country who have taken our hearts! Love you all!